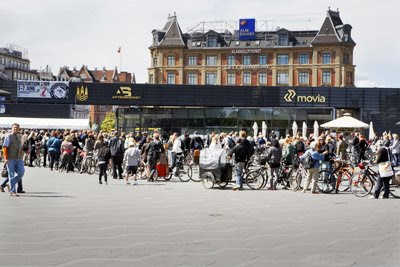 Copenhageners line up on City Hall Square to get an RFID chip installed on their bicycles. The City of Copenhagen has just launched an innovative program aimed at tracking down stolen bicycles. The program is called "Få en lille chip på" or "Get a little chip on" and involves handing out 5000 free RFID chips that Copenhageners can put on their bicycles in order to participate in the pilot program that will run until May 2010. Here's a little film made about the first chip-handing-out event. Roughly 18,000 bicycles are stolen in Copenhagen each year [there are 1.9 million bicycles in Greater Copenhagen]. Many of them end up taking up space on the sidewalks and bike racks. The City wants to be able to track them down for you but also be able to keep the sidewalks and bike racks clear of bicycles that aren't being used. 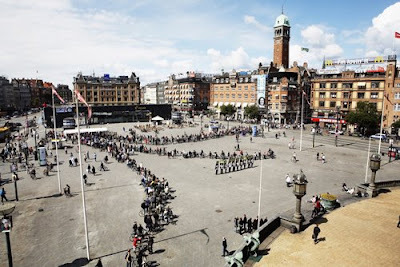 On June 4th, Copenhageners could show up on the City Hall Square [pictured] to get a chip installed and so many showed up that many ended going home chipless. The City, however, has more events planned over the summer. The chips are placed inside a red reflector, which is installed on the bicycle. You have to register to take part - name, address and email. So... how does it work? If your chip-equipped bicycle gets nicked you do what you'd do anyway. Report it stolen on the police website and inform your insurance company. Easy. If you're taking part in the chip program you can now also report it stolen to the City, on their website. There is a small army of people walking about the city everyday with the enviable job of irritating motorists. We call them Parking Attendents. :-) They are on the sidewalks of the city writing out parking tickets anyway so they will now be equipped with an RFID scanner so they can walk past parked bicycles, scanning happily as they go. If their GPS-equipped scanner registers a stolen bicycle, you will immediately recieve an email with a map featuring a red dot where your bicycle was found. At time of writing, 600 chips were given out on the first day and the rest of the 5000 will be handed out over the summer at various events in the city. "Copenhagen is a fantastic city to live in. We would like to make it even better for cyclists. It is both green and healthy to ride. 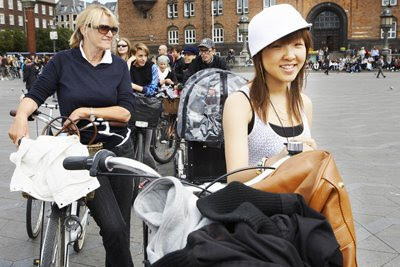 Copenhagen's goal is to become the world's best bicycle city by 2015. That's why we taking the intiative to do something about the many bike thefts and, at the same time, clean up the many bike corpses on the streets and in the bike racks. We want to do something that helps you keep your bike. Or, if bad luck strikes, something to help us find your bike for you again." The long-term plans on the drawing board, if the trial is a success, is to have RFID scanners installed in lightposts near intersections so that if a stolen bicycle rides past, it is registered. This way you can track the movement of the bicycle through the city. At the moment the chips are 'passive' meaning they only respond when a scanner reads them. There is a possibility, of course, to have 'active' chips that tell you where your bike is at all times. Could be interesting to see if that works in the future.